← How is your school’s workflow? I just wrote about workflows in school and I thought I would share my blogging workflow and how it has changed over the years. Obviously I currently use Byword2 right now but before I start talking about how this works, I figure I will start at the beginning. 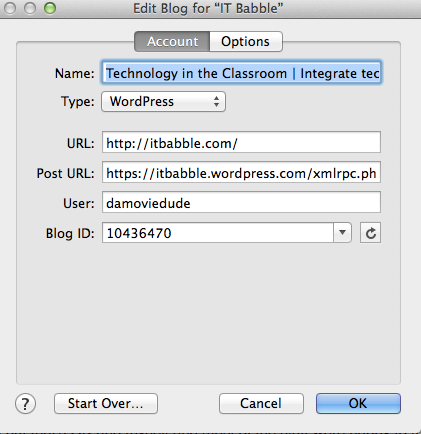 When Omar and I started IT Babble over five years ago (damn that’s longer than I thought) I simply logged into our WordPress blog and then wrote my posts there. What I found was that it was a bit of a hassle. I had to have an Internet connect, I had to log in, I had to get to the posts section of the dashboard and I had to upload each and every image. It just wasn’t convenient. I tried stand alone programs like Microsoft Word and Apple’s Pages but the problem here were the images. I would put them in my post, but when I copied and pasted my post over to WordPress, the images didn’t come over. So I started looking for programs that would let me publish directly to WordPress. I was surprised to find that my options here were quite limited and even more so on a Mac. What I ended going with was MacJournal. MacJournal is pretty sweet actually, I set up my blogging credentials. Then all I do is write and add my images. When I publish it goes directly to the blog. I can even select categories from MacJournal, set the date it will appear on the blog – I mean it is pretty sweet and that’s what I’ve been using for the past five years pretty exclusively. So why did I switch – what were the shortcomings? MacJournal was very good but there were some issues. On rare occasions the images wouldn’t publish. There was no rhyme or reason behind it – MacJournal just failed. Again, this was rare and not a big deal. Another reason was I had no access to the HTML code at all. There was no way I could tweak it, embed certain media from various services. At first this wasn’t a big deal but as my blogging progressed and my needs grew I often found that MacJournal was adequate but just not meeting my needs all the time. As far images, I was using Voila which is a great screen capture tool. I could resize, add images, add borders, blur out areas. It was lightweight and easy to use. It even let me organize them and then I would copy and paste them into MacJournal. The workflow was clunky but there really wasn’t anything out there that could do what I wanted. There was MarsEdit 3 which seemed to be my answer, but when I tried the trial I just couldn’t get comfortable with it. So I resigned to using MacJournal and Voila. Recently I started using Coggle as my preferred Mind Mapping tool. I like Coggle a lot and one feature that it boasts is using Markdown instead of a rich text editor. This frees doesn’t clutter the workspace with floating palettes that contain formatting choices like bold, italics, font size, etc. It clears out all that stuff and let you focus on one thing – your ideas. After figuring out how to use Markdown language (that took a whole 30 minutes for the basics people and no need for coding experience is necessary) I found it an efficient and very quick way to work especially as the mind map started to grow – there was then nothing really in the way which is very nice – especially for presentations. Not only was it a good way to work but it supported images as well (as long as they were published on the web). 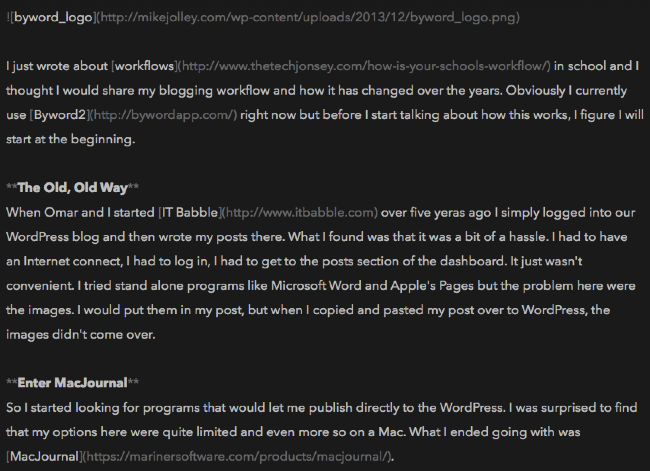 Recently I started looking again for another blogging program and came across Byword2 which is a markdown editor check out this post in markdown (I’ve taken a screen shot of the very beginning). Looks like a word processing app, but all formatting and images are handled with Markdown – which is easy to learn people. Also, Byword lets me focus on my writing. Right now, that’s all I see – no underlined red marks, no images, no formatting bars – just my thoughts and like Coggle – that’s the way I like it. OK, now to an area that was a bit of a problem – images. I needed a screen capture tool that was easy to use, flexible and could let me annotate when needed. As I mentioned before, I used Voila for this previously and it is great. So why switch to Skitch? In one word – sharing. With Skitch I can take a screen shot, annotate it, resize and then publish it directly to the web and give me a full link that WordPress will recognize and work with. Granted Skitch is not as robust or as good as Voila but I can work with that and am willing to give up some of those features in order to have all my images in one document and the ability to simply focus. Another plus is the cost. MacJournal costs $50 US dollars and Voila costs $30 (if you get it from the website you may find discounts there). Byword (with the publishing feature) costs $15 and Skitch is free and this makes my workflow much easier and more efficient. Good question and honestly maybe you shouldn’t so much, but the point I am trying to make here (as I did in my previous article) was that I didn’t just find something that was “good enough.” I wanted it to be better. I kept looking and refining my workflow to get it the way I like. I spent time researching and thinking about it and for you maybe blogging isn’t something you’re all that keen on – that’s cool. It’s not for everyone, but what about grading papers? What about planning out units? These are definitely tasks that I think all teachers should look into and can find some improvements? What do you think? Leave them, there comments below. This entry was posted in Opinion, Patrick Cauley and tagged blogging. Bookmark the permalink. Oh yea of little faith. Markdown can be done in TextWrangler and output an HTML file. 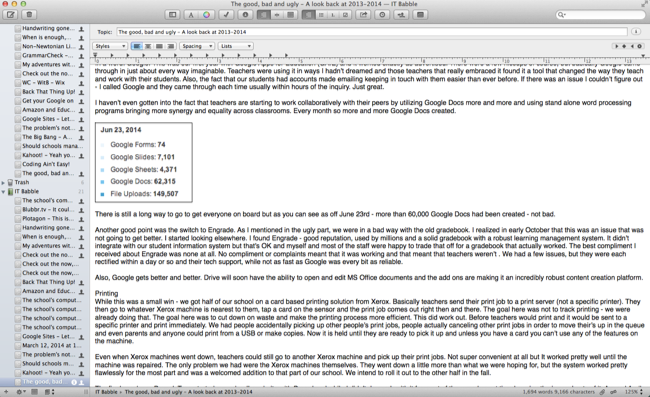 I like Byword because I can preview it and publish straight to the blog. Oh by the way – Is this your ball on my front lawn? It’s mine now, I’m keeping it! That’ll teach you kids!